Home Local News Filipinos online wants to impeach Leni Robredo for her Treacherous act! 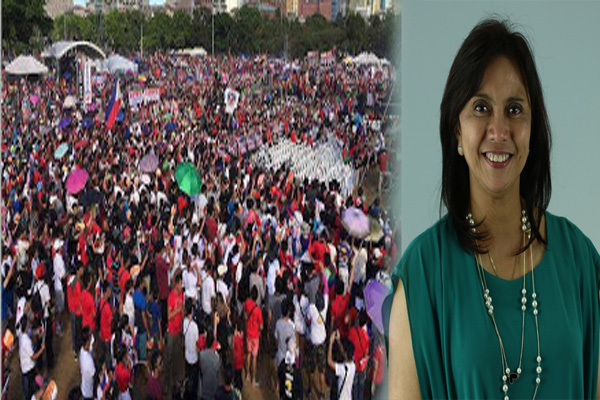 Filipinos online wants to impeach Leni Robredo for her Treacherous act! Sinabi ni Political Science and Lawyer expert Prof. Danilo Valleverde Pwedi umanong makasuhan si Vice President Leni Robredo sa kabila ng controversial na speech nito sa United Nations Convention. Leni Robredo was very careless with her words, she delivered a seditious and misleading speech to the international community who are not aware over the Philippines’ problem on drugs. Her speech incite the people to reject the sitting president and the police force”, Valleverde said. Presidential spokesman Ernesto Abella also dismissed Robredo’s controversial “palit ulo” scheme. While she (Robredo) has the right to speak freely on matters of public concern, she also has the responsibility to be careful with her statements especially avoiding unfounded allegations from questionable sources,” Abella said in a statement. “I think the vice president, I’m sorry to say, has been misled, has been misinformed, and has been misguided on the information she has received,” Panelo said in an interview. Sponsor Valleverde noted that Robredo can be charged with sedition over her damaging speech to the government. “I think the VP did not consult her lawyers properly. I think her speech was not examined by any of her lawyers. She has done danger to herself. Her claims were just inappropriate and unnecessary”, Valleverde said.